Summer is drawing to a close, and fall chores are ahead. This is a great time of year to aerate and overseed your lawn. Grass seed planted in the fall will be much more established by next summer’s heat, which will stress out any spring planted seed. Also it may limit your ability to use pre-emergent herbicides to keep weeds out of your turf. Falling Leaves…can be pretty but also a chore. Make sure to clean your gutters out often in the fall so they don’t get clogged with debris. Bulb planting…almost but not quite yet. 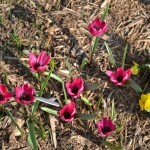 While some bulbs are quite forgiving, Tulip bulbs (for those of you lucky enough to not have deer!) really should not be planted until the ground has cooled. 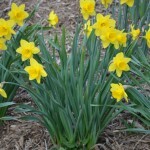 But now is the time to plan and order your bulbs for the best selection. 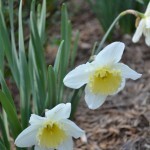 Some bulbs I adore: Daffodils – I know they aren’t exotic, but they sure are reliable, come in an almost infinite array of varieties with different sizes, colors, forms and bloom times. Deer and squirrels also leave them alone, which is a big plus for many of us. 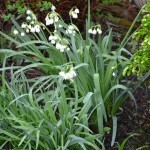 Snowdrops are also great, they will naturalize and are a welcome sight after a long winter. 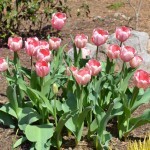 I prefer species tulips, they may be small, but they are much more reliable to return year after year. 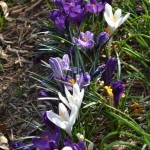 Some other bulbs to try: Crocus – another great naturalizer and early bloomer, Hyacinths – Beautiful, colorful and fragrant, Muscari (Grape Hyacinths) – naturalizes well, Scilla sibirica – small but pretty, Fritillaria – From the towering imperialis to the many species, they are distinctive additions, Leucojum (Summer Snowflake) – a later bloomer. All of these except the species tulips are deer resistant. 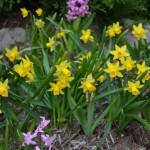 My favorite bulbs by far are Hardy Lilies. I am a Lily fanatic. By choosing different species and varieties you can have an extended show of gorgeous showy flowers that are great for cutting. 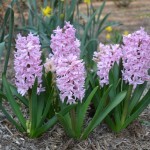 Some, like the orientals in particular are extremely fragrant. Like all bulbs, the foliage needs to ripen in order for them to gather energy to return next year, so don’t cut them with long stems for the first couple years. They will get stronger, taller and spread, then it is time to cut them for the house. You can dead head them after bloom, but leave the main stalk as tall as possible until fall. There are so many lilies it is hard to find space for all of them! But luckily they are vertical and can fit in small spaces. Unfortunately, deer adore them as much as I do. I’ll be browsing very soon to decide what new bulbs to add this year. If you are gradually filling in your gardens with spring bulbs (as most of us are who are on a budget) instead of marking the bulbs you have, consider marking the spaces you want to fill next year. A simple popsicle stick in the ground can give your direction on where to plant in the fall. So next spring, walk around and identify spaces you could fill in the fall. Or take pictures of the gardens in the spring so you can have a better idea where to add what in the fall. Our memories usually fail us by the time the bulbs go dormant. Pruning – Don’t trim your evergreens too early. Trimming them in early fall can cause a new flush of growth that won’t have time to harden off for winter. Wait until the temperatures have dropped so you don’t encourage new growth. For those of you with Knockout Roses (One of my favorite shrubs), don’t be shy about cutting them back if they are established. Bloom can go on until Thanksgiving in our area, so now is not the time, but once it has really gotten cold, take the hedge trimmers to them and knock them down to size. If they are new plants, they probably can just be tip pruned for shape, but after several years they can get huge if you don’t stay on top of them. No special pruning is required, just hack them down to about 18″. Next spring they will be bushy and full and re-grow faster that you can believe. The double varieties don’t seem quite so vigourous to me, so handle those a little more gently. You can cut back those butterfly bushes in the fall also, but don’t go too far…the plants need some wood over the winter to survive. In the spring you can be much more aggressive. I like to just cut them back by half in the fall, then again in the spring. Don’t prune your Azaleas, Forsythia, Hydrangeas, Rhododendrons, or Pieris in the fall. 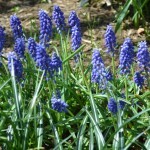 They have already set their flower buds for next spring and you will be cutting off your future flowers! Prune these spring blooming shrubs immediately after they flower. Annuals – Some are looking really tired by now. Lantana (the banner picture right now) is an exception. It is just reaching it’s stride. For those of you lucky enough not to have those tiresome destructive deer, planting pansies can really freshen up the landscape and give you a bonus of spring color next year. Other fall annuals are dianthus, dusty miller, alyssum, osteopspermum, and even calibrachoa (Million Bells). Calibrachoa will weather light frosts very well. Time to pull out those impatiens though. At least before the frost. Oterwise they are a slimy mess. That is if you didn’t get hit by the downy mildew epidemic this year. It seems every impatien planting I have seen has been devastated. It was a huge problem this season. So don’t blame yourself if your impatiens gave out on you, Downy Mildew may have been the problem. Spotify Premium Code on Greetings! google authorship seo on Greetings!